Yet another broadside has been fired in the war on dogs on Scarborough’s beaches. 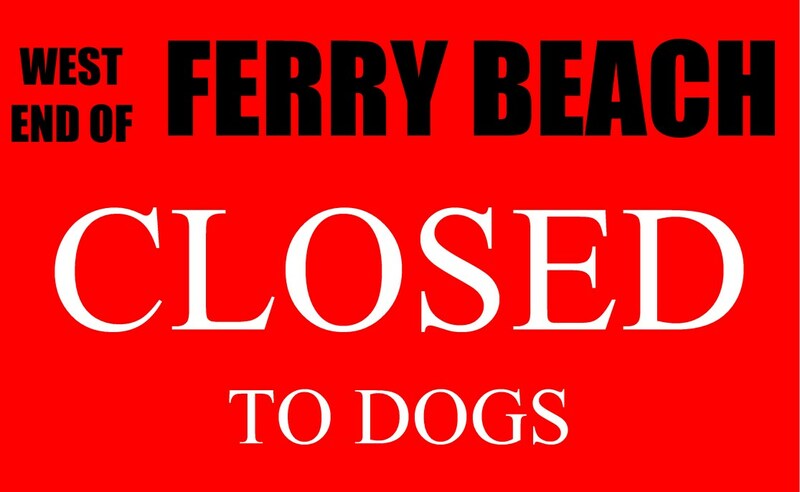 This time, a couple weeks after a portion of Higgins Beach was closed to both dogs and people, a large chunk of what many people consider to be Ferry Beach has been closed to dogs. 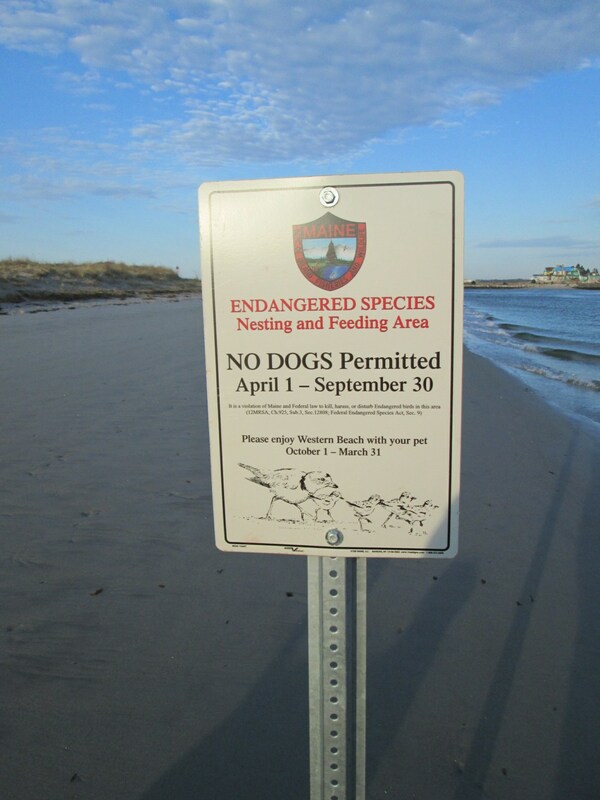 The closure of the additional beach area to dogs – leashed or not – is the doing of the Prouts Neck Country Club (“PNCC”). As you will recall, Western Beach, which is contiguous to Ferry Beach, is owned by the good folks of PNCC. 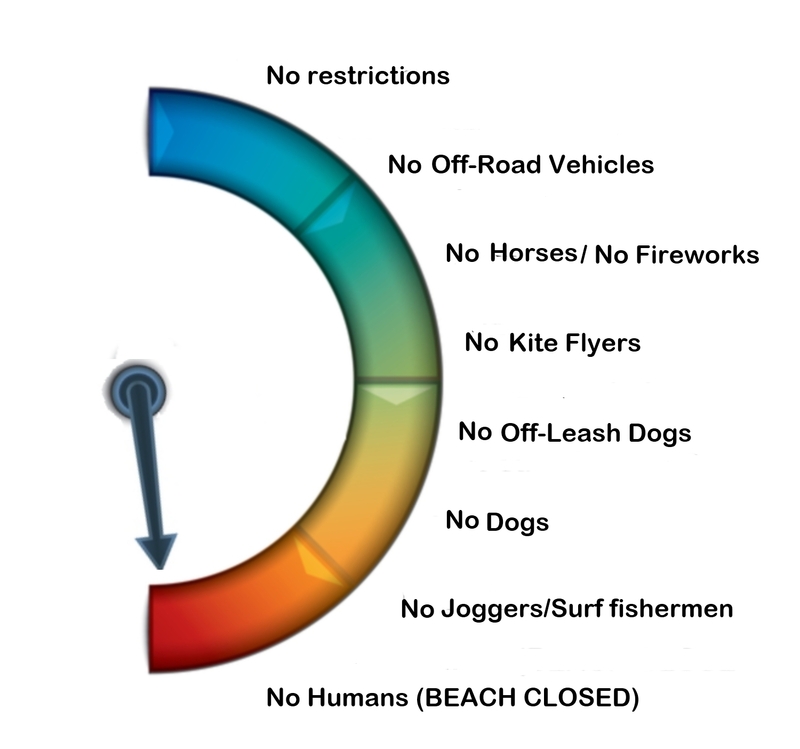 They put the “No Dogs All Summer” sign up at Western Beach last year. 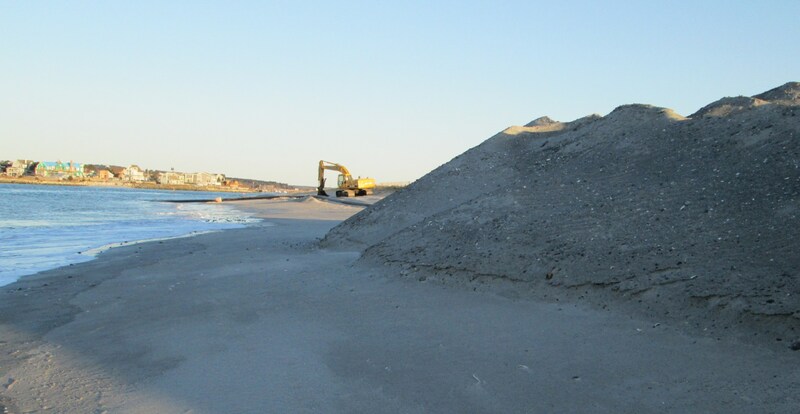 The policy and sign were probably part of the deal with US Fish and Wildlife Service (“USFWS”) to get the sand from the harbor dredge deposited on the beach in a manner that would protect their golf course from losing a couple of holes to Old Man Tide. Late last week, new signs went up in the middle of what most folks consider to be Ferry Beach. It turns out that PNCC’s beachfront property is more extensive than what many of us blithely assumed. 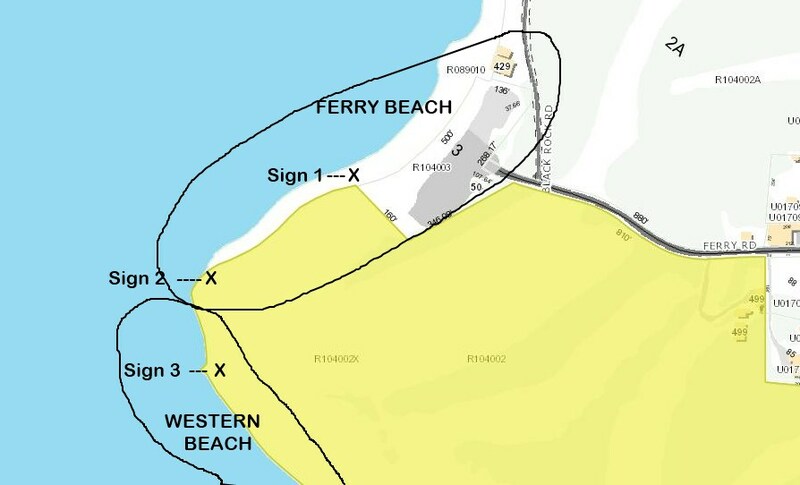 A review of the Town’s tax maps shows that PNCC owns the beach (at least to the high water mark) for 750’ or so northeast of Ferry Rock. The new sign that went up in the middle of Ferry Beach last week. So PNCC was inspired this year to expand their “no dogs” area by another 750’ of beach. Which, coincidentally, is pretty close to the “protected area” that the Ad Hoc Animal Control Advisory Committee had defined on what we all thought was Ferry Beach. So apparently the AHACAC was trying to establish regulations for land the Town didn’t even control. In any event, the relentless crusade to transform Scarborough beaches into sanctuary beaches rolls on. Higgins and Ferry have now been partially sanctuarized… can Pine Point be far behind? As I pointed out a few weeks back in “Dredging Up the Dirt,” there will undoubtedly be large incremental costs involved with stopping the dredge project as of March 31 and then restarting it after the conclusion of piping plover season (April 1 through September 15, according to USFWS). Costs which could have been avoided if the dredge completion deadline had been extended a few weeks into plover season. Silly me! There is no such dollar limit! And that, gentle readers, is the nub of this whole problem – the Endangered Species Act fails to provide any commonsense balance in the efforts to preserve and promote threatened species. The only time a USFWS action gets overridden is when it is so egregious that public outcry gets a US Senator or Representative to intervene. (See the recent Camp Ellis jetty experience, for example.) So perhaps if we had a Town Council that actually represented the citizens of the Town, Washington officials could have been persuaded to call the USFWS dogs off (to use a poor choice of words). Oh, well. In our current situation at Western Beach, I understand that the US Army Corps of Engineers, who are conducting the dredge project, have not even calculated the additional costs associated with the dredge stop/restart. So clearly cost could not have been one of the elements weighed in the decision to stop the project as of March 31. All that mattered was the unlikely possibility that a plover might arrive. And for this possibility, no cost was too great. After NALCO, the dredge contractor, was ushered out of town in early April, a rather unbeachlike pile of sand was left on Western Beach. 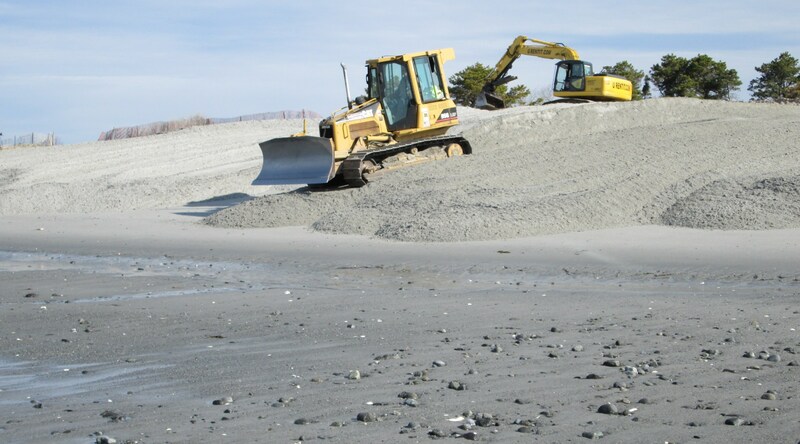 Curiously, or perhaps not so, the dredged sand had been deposited right at the spot on the beach where tidal erosion has historically most affected the golf course. In any event, the pile of dredged sand sure didn’t look like attractive plover habitat. The sand pile at Western Beach as the dredge ended in late March. Today, April 21, 2014, Gorham Sand & Gravel was hard at work leveling the sand pile into a more gently sloped form. Let us hope that the resulting landscape receives the Good Scratchkeeping Seal of Approval(1). A final note about “beach nourishment” in general. That terminology has always bugged me. (And I will readily admit to being easily bugged.) It just sounds so Disney-esque. Like a platoon of pixies will be flitting in and dispensing little bursts of magic, vitamin-fortified sand. When, in fact, beach nourishment consists of huge, diesel-powered machinery messing with tons of sand and in the process wreaking havoc with the “natural” beach ecosystem. It’s really not that pretty a sight. (1) This was a feeble attempt at plover humor. A ‘scratch” is what a piping plover’s nest – such as it is – is known as. I know, I know; when you have to explain a joke, it ain’t that funny. But I couldn’t help myself. Sorry. I can’t say this often enough – thanks to all of you who read, comment on, follow and share this blog! And thanks also for the many kind words of encouragement. It is heartening to know that so many people share the concern for continuing fair and reasonable access to Scarborough’s beautiful beaches. Thank you! This entry was posted in Uncategorized on April 21, 2014 by Site Author. To quote from the story: “The biggest news of the season is the unfortunate death of a plover fledgling caused by an unleashed dog on Pine Point Beach in Scarborough…” Lest you wonder where they stand on the issue of off-leash dogs on beaches, “Maine Audubon encourages towns to ban dogs on beaches throughout plover season, or at very least, require dogs to be leashed during the plover season [emphasis added].” You will recall that “plover season” runs from April 1 through September 15. So feel free to enjoy playing and swimming with your dog on the beach after the spring and summer are over. It’s only in the last paragraph of the lead story that Maine Audubon finally gets around to sharing a bit of good news: “In sum, Piping Plovers successfully fledged 85 chicks on Maine’s beaches in 2013, a whopping 21 more fledglings than last year.” In fact, though Audubon doesn’t mention it, there were more chicks fledged in 2013 than in any year since 2002. A less cynical presentation of the year in review might have been headlined: “Plovers have best year since 2002,” rather than vilifying man’s best friend. So, according to Maine Audubon, piping plovers overcame challenges in 2013. And in the 2012 Newsletter last year the headline was “Plovers persevere despite a challenging year.” Those little guys sure face a lot of challenges! Hey, guess what, Audubon? 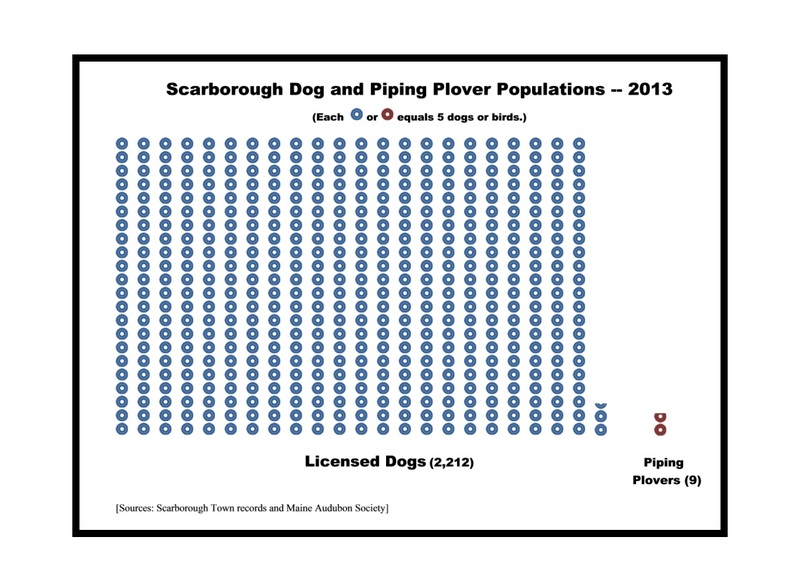 It’s been a challenging year for dogs and their owners in Scarborough, too! 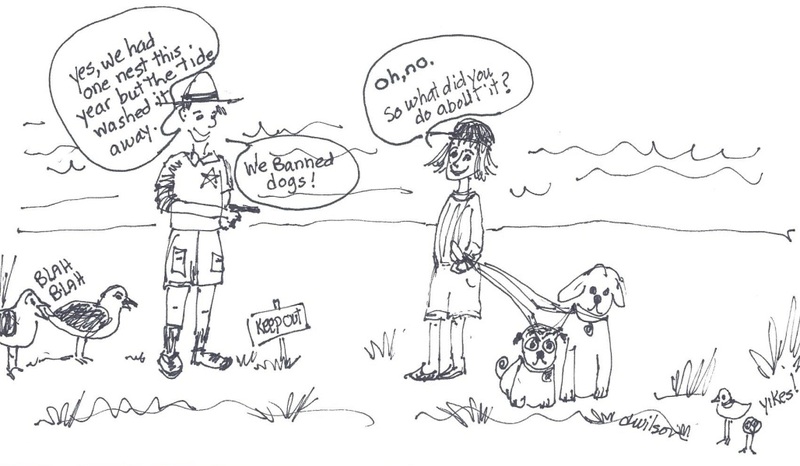 Thanks to Donna Wilson for this spot-on summary of “best practices” in beach management. And let’s not forget – there are human beings that go along with all those dogs. Rarely have so many been so restricted for so few. Today’s Town Hall Riddle: When is an ordinance not an ordinance? Far be it from me to question the motives of the esteemed Council, but one can only imagine why this resolution/ordinance format was employed. As if the proposed Sanctuary Beach solution isn’t already complicated enough. And what mischief could possibly be created by a Town official having carte blanche authority to declare a “plover emergency”? 1. Has the Town ever used this linked resolution/ordinance format before? 2. Has any Maine municipality ever used this approach? 3. Did the Town attorney review this approach for possible drawbacks? 4. What did she say about it? That’s probably not the sort of emergency the Council is envisioning. They’re probably thinking of something more along the lines of a chick “going missing.” Sort of an Amber Alert for the little guys. Of course the little guy’s disappearance was probably a result of him having become a tasty (but not very filling) snack for a fox, skunk or gull, but what the heck. At least it will get the dogs off the beach. And that, it seems, is all that really matters. 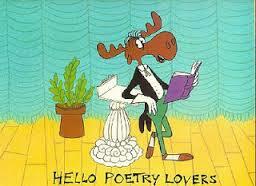 Poetry contest deadline extended until April 27! I confess to being a bit surprised by the sharpness of Maine Audubon’s public communications singling out of dogs as a major threat to piping plover success. Maine Audubon knows as well as you and I that dogs are near the bottom of the plovers’ threat list. Yet they portray dogs as a major villain to the species. At some point – and perhaps we’re very close now – Maine Audubon members who are also dog owners may think twice about renewing their membership in an organization that is so clearly anti-dog. Considering that there are around 200,000 dog-owning households in the state, Maine Audubon’s stridence on the dogs/plovers issue could well have a negative impact on their membership level. This entry was posted in Uncategorized on April 12, 2014 by Site Author. 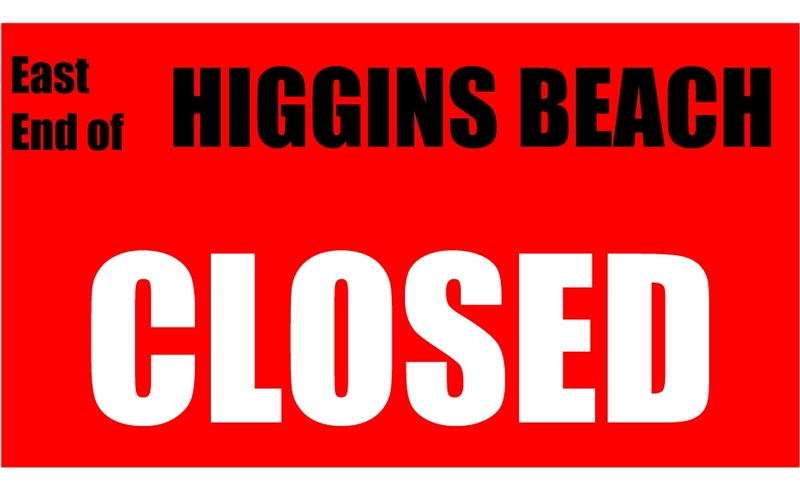 Yes, indeed, the eastern end of Higgins Beach is now officially closed. Not just to off-leash dogs. Not just to leashed dogs. But to us good ol’ human beings as well. Yup… BEACH CLOSED. 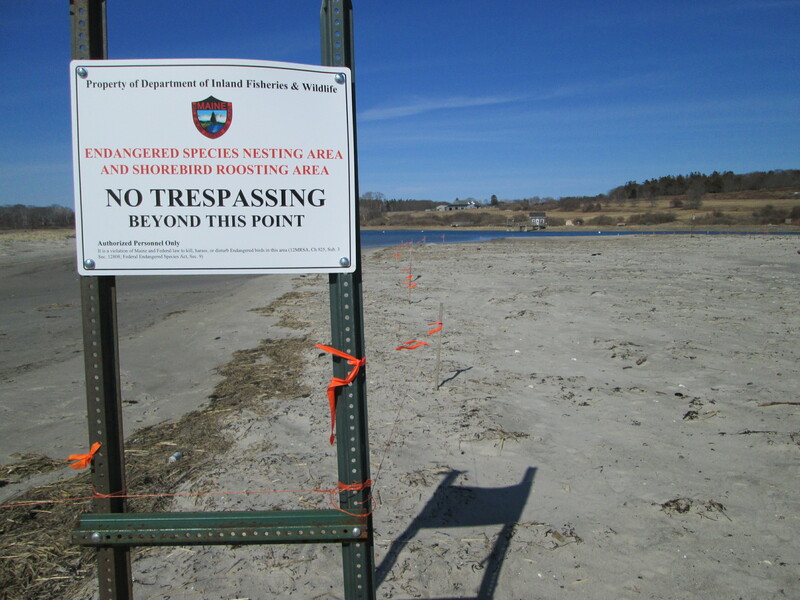 On or about April 4, the Maine Department of Inland Fisheries and Wildlife (“MDIFW”) staked off the eastern end of the beach and installed “No Trespassing” signs. No dates were specified so one can only assume that this piece of beach has permanently entered “Sanctuary Beach” status. Admittedly it is not a large portion of the beach. And it is State property. Although as State residents and taxpayers, shouldn’t we have some say in the matter? Or at least get notice that this was going to happen? No, that’s not the way MDIFW works. Like the US Fish and Wildlife Service on the Federal level, MDIFW is a law unto itself. It is, you must remember, all about the birds. Now at least part of Higgins Beach has reached the goal the bird extremists have for ALL our beaches. So now all that talk of a “slippery slope” seems a bit more real, doesn’t it? Last year we saw privately-owned Western Beach become no-dogs-all-summer, apparently as part of the beach nourishment/golf course protection deal. Now a chunk of Higgins Beach is closed to all. Chalk up another one for the bird extremists. Entries must be in standard limerick form, be suitable for family reading and be free of libelous content. 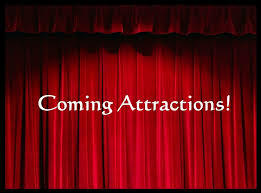 Entries should be submitted to tthannah@yahoo.com and are due by 5pm on April 15. The decision of the judges is final. No purchase necessary. Residents of New Mexico may not participate. All entries become the property of CloudMedia LLC. Rules and deadline subject to change. 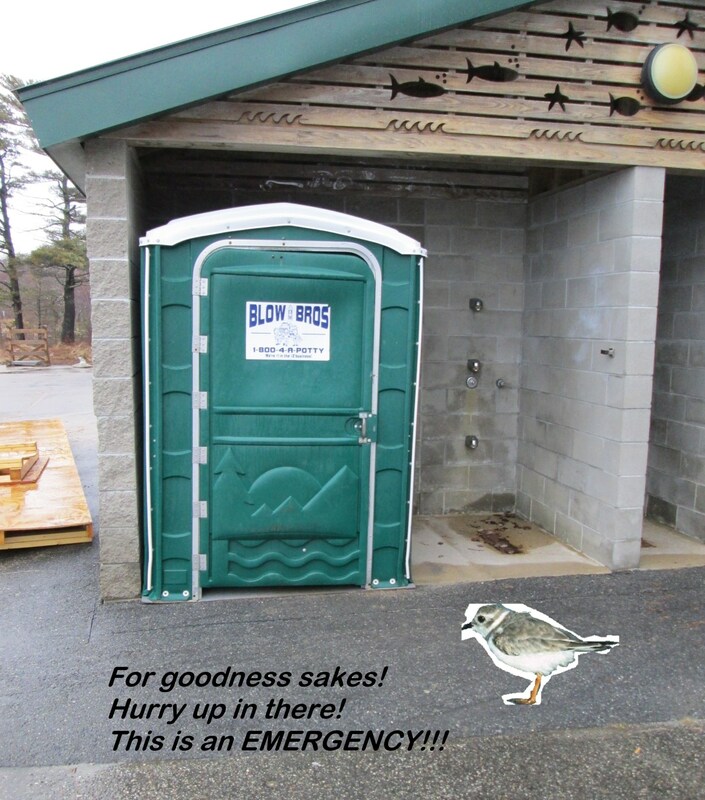 • Are You Prepared for a Plover Emergency? Five Things You Should Know. This entry was posted in Uncategorized and tagged higgins beach, piping plover, scarborough, scarborough beach, Scarborough Town Council, United States Army Corps of Engineers, United States Fish and Wildlife Service, US Army Corps of Engineers, usfws, western beach on April 6, 2014 by Site Author.